When combat assault rifles are a topic of discussion, the Avtomat Kalashnikova emerges supreme and the most successful combat rifle in the history of modern warfare. No other shoulder fired weapon stirs emotions like the AK47. Although nothing more than wood and steel, the AK47 retains a character, a certain romanticism, only found in the literary works of Russian poets like Alexander Pushkin; often described as evil and vicious by ardent, well intentioned, individuals lacking the capacity to reason that it is not the tool that makes the craftsman. Yet, it is fait accompli, the gates of heaven have welcomed countless innocents from its encounter. As true as the later is, the AK47 has earned global admiration for its robustness and simplicity of design, and a young Russian Sargent by the name of Mikhail Kalashnikov was author of its story. Sixty-five years after its design, the AK47 remains the weapon of choice for many, if not all, of the developing nations around the world. Kalashnikov’s design also influenced homegrown small arms like the Israeli Galil. Like the Pax Romana, which gave Christianity a fertile period that assured its growth, the AK47’s accelerated distribution was the product of Soviet Russia and the Cold War. It’s estimated that over 50 million AK47s and derivatives have been produced since 1949, when it was first adopted by the Soviet Army. Design and development of the AK47 was heavily influenced by the Russia experience during WWII. Faced by Germany’s mechanized assaults it became more important to deliver mass short-range area fire than continue the use of full power ammunition designed to engage point targets at 600 – 800 meters. 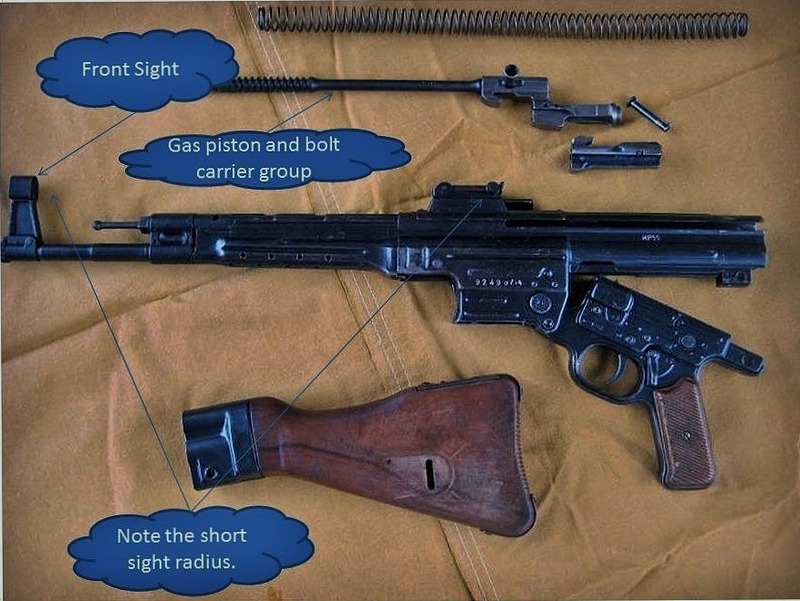 Russia’s response was to develop the 7.62x 39 round and Simonov’s SKS rifle. Although the SKS was a poor response to Germany’s MP44 (StG44) it moved the Russian army closer to an assault rifle concept. 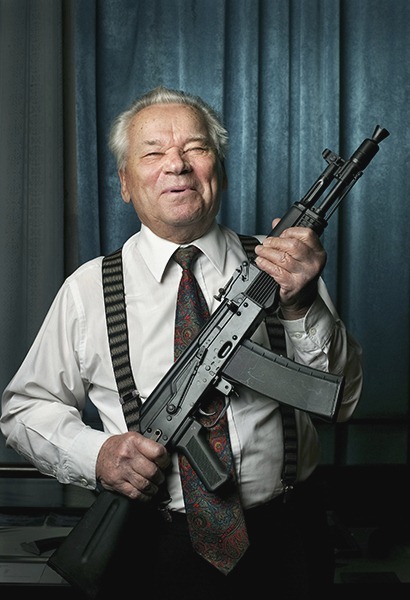 In 1947, Mikhail Kalashnikov, developed the AK47 – a selective fire 7.62 x 39 assault rifle. There’s been considerable discussion on just how much influence the German StG44 had on the development of the AK47, with some suggesting the AK47 mimics the StG44, an allegation that Mikhail Kalashnikov vehemently denies. Yet, interesting similarities surface with a side-by-side comparison of the two. For example, the short sight radius and rear sight block, the bolt carrier and gas piston assembly and possibly the combined use of stamped and milled parts. The trigger, bolt assembly and unlocking raceways bear similarity to the M1 Garand, and the safety mechanism was clearly influenced by a John Browning’s design found on the Remington Model 8. Before modernized and morphed into the AKM, the AK47 was produced in three different types (Type I, Type II and Type III) each type incorporated a number of design changes that I’ll mention briefly. 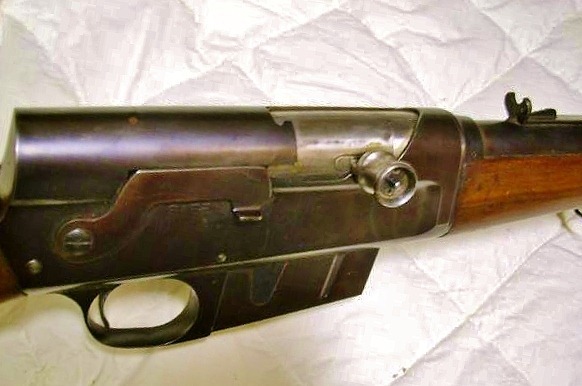 The Type I to Type II transition involved a change from a stamped receiver to a milled receiver and the addition of a receiver block for mounting the stock to the rifle. After its introduction in 1959, the AKM or Modernized AK47 was the “de facto” standard and further improvements to its design were not made. Telling the difference between the AK47 and its modernized version, the AKM, is straight forward. 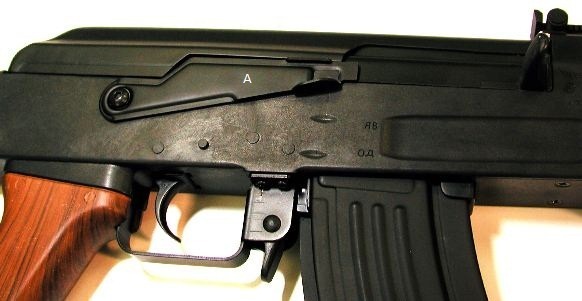 The AK47 will have a milled receiver, lacks a muzzle brake, has a smooth receiver cover and the gas vents are aligned horizontally along the longitudinal axis of the gas cylinder. The AKM will have a stamped receiver, ridged receiver cover (usually three ridges), a slant muzzle brake and the gas vents are aligned in a radial pattern along the interface of the gas cylinder with the gas block. Additional designations of N and P refer to the presence of luminescent element in the sights (P) or the presence of a rail along the side of the receiver, for day and night optics (N). AK’s with folding stocks were designated with the letter (S). It would be 1974 before a major change in direction occurred, and that was the production of the AK74. Although the design of the AK74 was identical to the AK47, the AK74 was chambered for the 5.45 x 39 round rather than 7.62 x 39, and featured a redesigned muzzle brake. The AK74 replaced the AK47 as the standard issue carbine of the Soviet Army. AK47’s may not be imported into the United States because it does not meet the “sporting use” definition as specified in law. 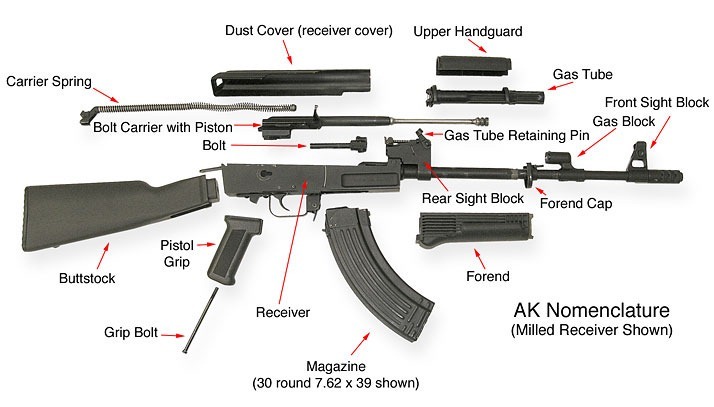 As a result, all AK47’s imported into the United States are configured in sporting configurations, meaning the offensive parts are replaced with acceptable parts prior to entering the country. Once the rifle arrives, the acceptable parts are removed and replaced with U.S. made parts to make the rifle 922r compliant. The process destroys the authenticity of the carbine so it is impossible to acquire a genuine AK47, AKM, AK74 and a slew of other models and firearms. It’s a law that stands as a monument to our stupidity and I hope that the “sporting use” language and/ or the import band are repealed. With over 50 million AK47’s used and/or produced in 55 countries around the world it is unlikely that Kalashnikov’s brain child will fade away into oblivion, but times change and the need for a more advance weapon systems demands a facelift. So, just what is wrong with the AK47? Depending on who you ask, AK47s are either loved or dismissed as cheap pieces of junk. In the United States, they’ve taken on a cult status very much like driving a SAAB. Interesting comments like: “it’s a stamped receiver that does not hold up” fascinate me since Heckler and Koch have been integrating stamped parts with milled parts for years, and across a large family of carbines that everyone likes. I suppose if you’re influenced by appearances, the Kalashnikov rifles are the ugly duckling of the genre; however, it’s only when you look beyond its physical appearance that you can gain an appreciation for the design. Don’t get me wrong, I recognize there are limitations, but given it is now 65 years old even its harshest critic must admit that it was quite an accomplishment. Notwithstanding its outward appearance, it is highly probable that were you to dig one out of the ground and load it, it would still fire. That level of reliability is an excellent reason to carry one. It’s often been said that as long as there is a round in the magazine the AK will go “BANG”; the reason is the simplicity of its design. With a total of 8 moving parts, the AK47 or AKM family of carbines have the least moving parts of any assault rifle fielded, which when combined with looser machining tolerances makes the AK47 impervious to debris or heat related stoppages even without lubrication. The AK47 was designed to quickly outfit and train an army of conscripts. Other than the geopolitical climate of the Cold War reliability and simplicity are the overwhelming reasons why the AK47 became the weapon of choice in many developing nations. Operations like field stripping and maintenance can be taught easily and in a matter of minutes to combatants who are illiterate and poorly trained. This is a short video prepared by Jim Fuller of Rifle Dynamics in Las Vegas, NV. Jim shows you how to lubricate the AK47. The AK47 has also been described as a “pray and spray” weapon. A classification that is on point to some extent but needs to be framed in proper context. If you examine the selector of an AK47 you’ll note that the first position coming off “SAFE” is FULL AUTO. This is an indicator supporting its design objective, which was to deliver mass fire on an area target. Secondly, the sight radius on the AK47 rifle is quite short when compared to the M16, M4, HK G3, M14 and M1 Garand. The rifle was not intended to provide accurate point target fire at longer ranges. Soldiers would most likely use the front sight to make the shot. Finally, the 7.62 x 39 round, originally developed for the Simonov SKS rifle produces a strong recoil impulse when fired in the AK47. When all of these factors are placed in play, it’s reasonable to expect that the AK47 is not a tack driver. Making the “pray and spray” perception ill-informed. 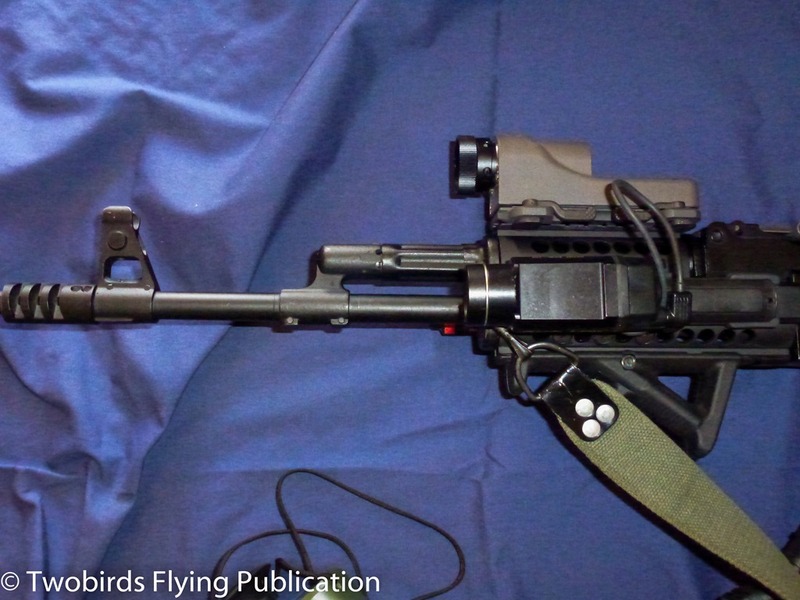 In reality, when fired in semi-automatic mode, using proper trigger reset and advanced optics like the M68 weapon sight the AK47 is capable of 2 MOA throughout its effective range. Making the AK47 more accurate would involve improving the sights and tightening operating tolerances, and changing tolerances would adversely impact the weapon’s reliability. Magazine length has always been an issue with its critics. The AK47 magazine extends beyond the weapons grip so it hinders firing from the prone position. A deficiency that I didn’t mention earlier, because I wanted to address it with a short video, is that on the last shot fired, the AK47 and many of its derivatives, will not lock the bolt open on an empty magazine. I don’t see that as a major issue and it’s certainly something that can be handled through training. So far, we are left with some interesting observations about the AK47. First, they can be built quickly and inexpensively. Second, they are easy to operate and maintain; reducing training times and cost of operation. Finally, there is a high percentage of parts commonality, few moving parts and high degree of reliability. It sounds like a strong business case to me! Before moving on to current modernization efforts underway, I want to share one observation. The relationship between machining tolerances, accuracy and reliability is not a linear function. A one unit tightening of tolerances does not yield a one unit increase in accuracy, or on the down side a one unit decrease in reliability. Given current assault or combat loads, a soldier engaged in MOUT operations is physically incapable of holding 1 minute of angle accuracy so it is far more important, in my view, to provide him or her with a weapon capable of delivering large volumes of fire with utter reliability. This is the criteria that reigns supreme in my mind; however, there is no doubt that the AK47 and AKM are in need of a facelift. Is the AK47 obsolete in concept or form factor? I happen to think it’s the later. With a modest face lift, it can brought into the 21st century keeping its timeless qualities. A modernized AK47 would reflect an improved stock and grip for greater function and durability, it would include a quad rail system to support a variety of enhanced aiming devices that include red dot sights and laser aiming modules, IR illumination and IR laser aiming modules. 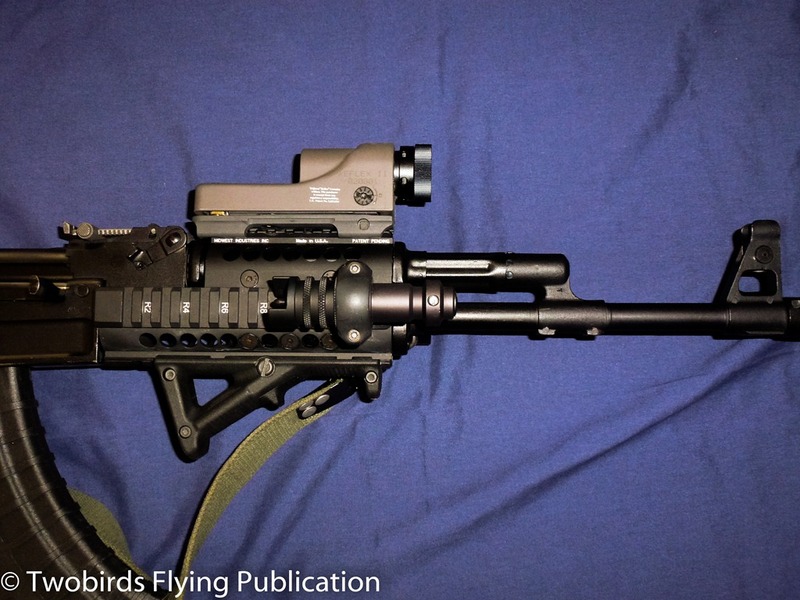 It would include support for a vertical fore grip and a variety of other accessories that are Picatinny compatible devices. New receiver covers are entering the market that extend the rail system so the sighting optic can be brought closer to the shooter’s eye. The Kalashnikov pictured above is capable of supporting any of the existing technologies currently in use with the M4 or M16. Although we’ve added minimally to its weight we’ve retained its reliability and enhanced its accuracy. The same improvements made by the owner of this AK47 can be readily made to the AK74 due to its similarity of design. At a retail cost of just over $200, the owner of this AK47 has a rifle that is as capable, if not more so, than many of the carbines available in today’s market. 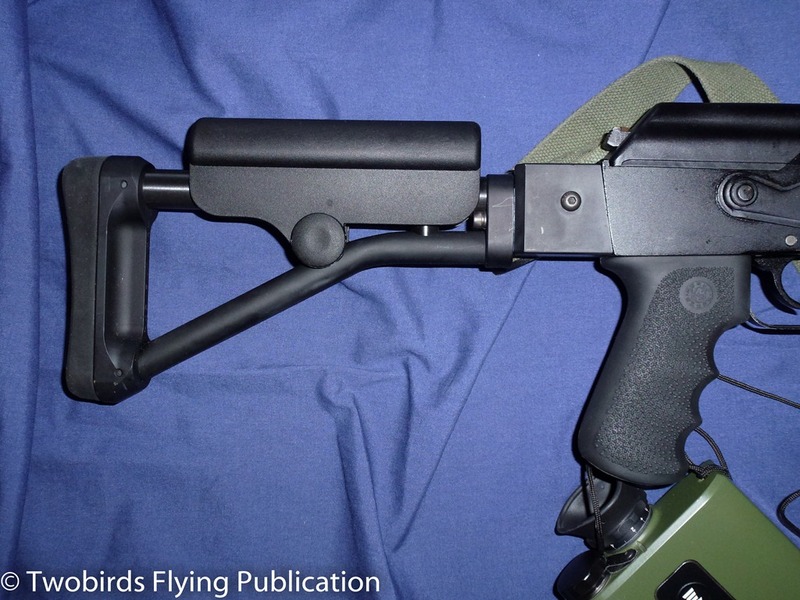 Other improvements are on the way and they include magazine designs and recoil mitigating devices (in the meantime use a telescoping Bulgarian recoil spring). This entry was posted in Weapon systems and tagged 7.62 x 39, AK47, AK74, AKM, Kalashnikov. Bookmark the permalink. Check out the Remington Model 8 or 81 Police rifle. That’s the gun that Frank Hamer used to kill bonnie and Clyde B., and not the BAR like EVEYONE thinks. That’s the Remington Model 8 that REALLY looks like the AK, banana clip and all. Let that blow your mind. Where can that but stock with the check rest be purchased. I have a similar but stock that folds and would love a check rest like that one. It appears that it would work, what company or vendors offer that check rest?